Virtual Stance Works - Forums - V$ Ren's Automotive Adventures Continues!! Forums / Street Legal Racing Redline / Roleplay Area / Personal Roleplay / V$ Ren's Automotive Adventures Continues!! YES! It's true! I'm back! Some of you were probably wondering why my old thread suddenly vanished again.. Well.. Stuff changed a lot yet again. We kinda disbanded as Garage Contraband and everyone did their own thing the last few months. But that didn't mean it's the end of our garage!! I actually took over our old workshop and rebuilt it into my own! To pay for the whole building and renovation I sadly had to sell all my previous projects.. But don't worry - we might still see them here and there! One thing that's actually pretty crazy is that I'm about to make this whole thing my actual job. I'm actually working at the Upgarage that I was previously working at before Garage Contraband but just to make some extra money before reopening the garage officially. With all that covered and done I still had 20.000V$ over - It was obvious that I had to get a new project. Especially because of the "new" garage. And when I started looking around I found this.. This was the perfect starting point for me. This really slightly tuned FC just struck directly into my eyes. Especially for that price! 890.000¥ (about 8.000V$) !! In my opinion this thing is already looking pretty nice. It came with that really cool oldschool Border Racing front bumper and a set of 16 inch Enkei RPF1 with some pretty run down Continentals on them. The engine is pretty much the stock RE but with some supporting mods like a bigger intercooler and radiator, a big HKS air filter and so on. So nothing show-off worthy lol. Suspension is pretty much stock aswell. Only other cool thing is the old Bride seat and Nardi steering wheel it came with. I think thats about it. I'm currently just doing a full service on it and checking all the nuts and bolts to make sure it's good to go to get it's shaken. Yoooooo Renny good to see you back man! Looking forward to you adventures as you start over again! You've got a strong starter as well, I dig that RX-7 so much! # BigSmoke : Yoooooo Renny good to see you back man! # Niatross : WELCOME BACK BOI! Aye , welcome back my dude ! Congrats on the purchase of that amazing looking FC , i really dig the RPF1´s ! Breh where have you been during the days!?! Welcome back to the scene anyways, i'll be stay tuned on your build! That's a great find! I really like the bumper, aftermarket ones usually expose the popups and i really don't like that cause it kinda misses the whole purpose. Enkeis look good there too, it just needs some low to make them fit perfectly! Also mismatched seats always look a bit off for me but i guess you don't really need another one. Great to see you back in the game! Wassup? Already has been 2 weeks since the last update but I was busy with boring paperwork because of the shop and various other things.. There are some really great things I have to talk about tho - I got my FC fixed up and registered! Since it would be illegal to drive the FC on the roads (duh), I had to call some of my old friends at Upgarage to ask if someone had the time and the right equipment to get my car towed to the traffic office. Turned out that one of my old colleagues actually had to get one of his projects (that we might see on here sooner or later) registered aswell and that he could get us a two car trailer. That's what we ended up with. It wasn't easy to get the FC registered since the people at the traffic office gave me a hard time when the car went through it's shaken checkup. Apparently it leaked a bit of oil and the rear shocks were trashed. So before I could do anything I got some papers saying I have to fix it up a bit more. Looked under it myself and yes. The engine leaked motor oil. The shocks leaked hydraulic oil. Huh. So the fixing (and customizing) began. We towed the FC right back to the shop and instantly put it onto the lift, started inspecting the suspension a bit further and came to the conclusion that I should just buy a whole new set of coilovers. So I got myself a brand new set of Tein Super Street coilovers for around 1.300V$. The car instantly felt way better and gave me the possibility to make it lower (or in my case - basically slamming it to the ground). That same colleague that was helping me towing my car also asked me if we wanted to maybe trade our wheels and see if we like the change. I instantly said yes as soon as he said that he had some R33 wheels laying around with some pretty nice Advans on them. I was really worried that the typical rotary issues already hit me in the first two weeks of owning it. Thankfully it wasn't anything to big of an issue. The last oil change was long overdue and I already had planned to do one anyways (since this is one of the things that you definitley should do when buying a used car). So - I went to the local Autobacs - got everything I needed for a small service - went to the garage and then - service time. Gave the engine and bay a good clean so everything looked as good as it could. THEY SAID YES! ... uhh. yeah. The FC is registered and ready to go! What a relief! The first official drive felt so incredibly good. Finally hearing that thing BRAP proudly down the streets of Tokyo was so cool! Took it down to a small meet, met some friends and had a good time to release myself from all that stress that paperwork is giving me. Glad your RX-7 is now back and running again! What's your next plan for the moment? Continue modding it or keep it as-is? oh man that is the best looking FC EVER . It looks so clean and i really like the wheel combo ! Must be a proper delight to chuck around too! Oh boy, I love with your FC mate. That R33 wheel is looking nice with FC. And to answer Biggies question - I actually don't know myself what I'm going to do with the FC. It's probably just going to stay a normal street car. If you know me and followed my old threads, you might remember that I have a special connection to a specific type of chassis. One that's seen as "overused" by a lot of other people. Ehm.. yea..
Might have bought another S13 lol. Whoops. 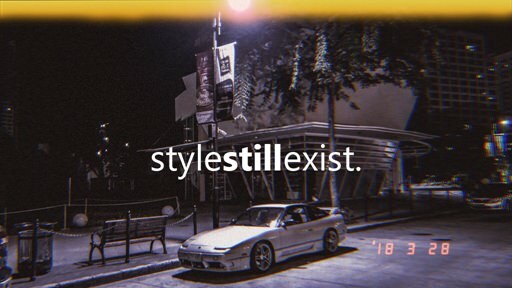 To be exact - It's a '98 Nissan 180sx Type S! This thing would've costed 759.000¥ (about 6.000V$) but I actually managed to get down the price a bit by buying it with cheaper wheels. It was supposed to be sold with some Gram Light 57C replicas but since I'm against reps and want to swap this thing to 5-lug anyways it made more sense to play around with the price a bit. They gave me some old used Teardrops from a S13 Silvia on some completely used up tires instead. The whole price was dropped down to 5.500V$. And there it is. And just like the FC, the S13 is basically untouched. Only "interesting" mods on it are that knock-off Kakimoto exhaust tip, a HKS pod filter and some no name intercooler which does actually do it's job. Other than that - stock. Really rare sight even in Japan. Hehe. Even the interior looks clean and well maintained. None of my previous S-Chassis have been that clean. Pretty proud of this one. Even tho I might not have a strict plan on the FC, it's pretty clear where the S13 is going. Don't worry. This is not going to be some sIcK dRiFt mIsSlE BRUHHH. I will definitley try to keep this thing as clean as possible! Let me introduce you to one of my very first customers. He had the chance to work with me since a few months even tho the shop isn't even open yet. And you might recognize his car from somewhere.. Doesn't ring a bell? Let me help you.. HE CHANGED THE ZENKI FRONT. I'm normally against changing Zenkis to Koukis but there was a reason: In his very first track day with the S14 he actually managed to damage the front so much that he had to change most of the panels.. yeah. This project was so much fun and we will definitley see more of this S14 and more similar stuff like this. So will the 180 be a kyusha daily build? That 180 is so damn clean it makes me ashamed of how I ruined mine. Also absolutely love the FC, R33 wheels look so good on it. 180 again, huh? Man, i wouldn't change a thing on this one! Well you probably will so it should be interesting lol. Also it's nice to see your old S14 in good hands! That's a really nice find!